Five Mile Mountain is located along the popular Tongue Mountain Range in the Lake George Wild Forest of the southeastern Adirondacks. The 2258 foot mountain is found after hiking 3.5 miles on the Tongue Mountain Range Trail. 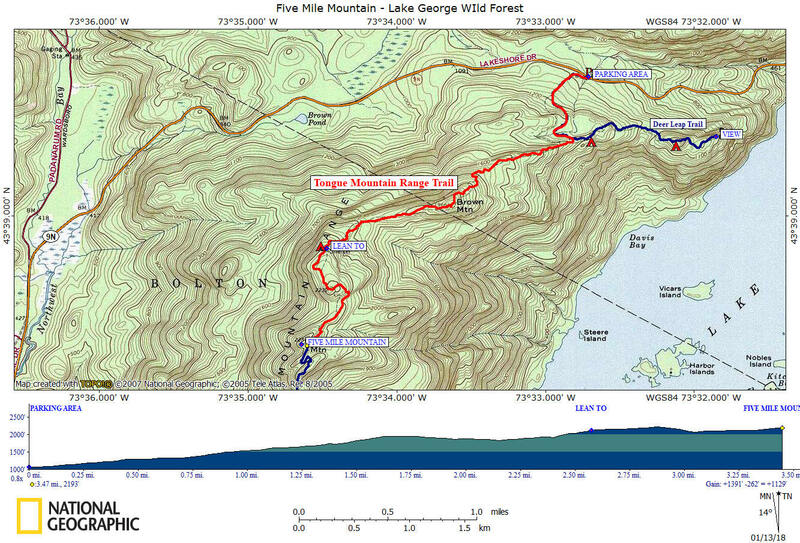 To reach Five Mile Mountain you'll first climb the 1966 foot Brown Mountain and pass the Five Mile Mountain Lean To. Be aware of timber rattlesnakes, as this area is known to have rattlers. 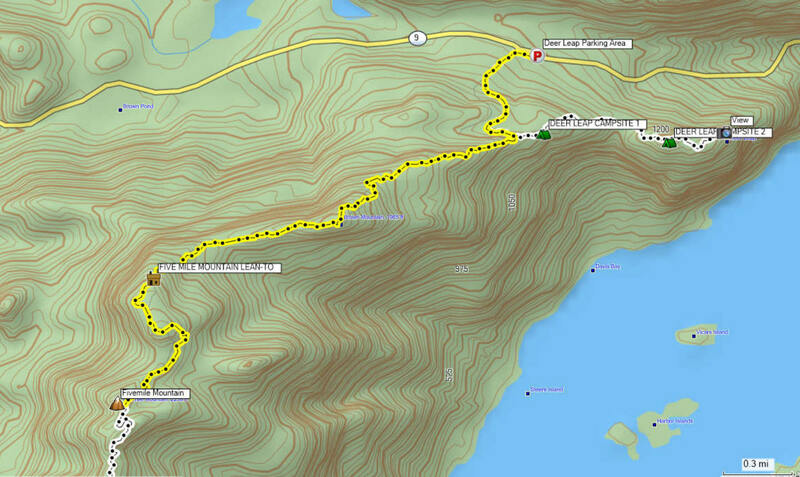 There is an elevation gain of over 1300 feet for this 3.5 mile one way hike. Continue on the Tongue Mountain Range Trail as the trail is still climbing up Brown Mountain. Soon after passing the summit of Brown Mountain there is an overlook with a nice view at 1.7 miles. You will be following rock cairns as you cross over an open rocky area at 2.4 miles. The Five Mile Mountain Lean To is reached at 2.6 miles. This shelter is also known as the Tongue Mountain Camp Lean To. There is a really nice view from near the lean to. After the lean to there are more views and you'll find blueberries in season. The summit of Five Mile Mountain is reached at 3.5 miles. There are more views just past the summit as well as from off the trail. But be AWARE of rattlesnakes if you decide to wonder off trail. You can find more info on this hike as well as many other hikes in this area by purchasing the Hiking Guide to the Adirondack Eastern Trails .